Hey Y’all! I’ve been doing a lot of new things to my room lately so I thought I’d give y’all a tour of my bedroom! 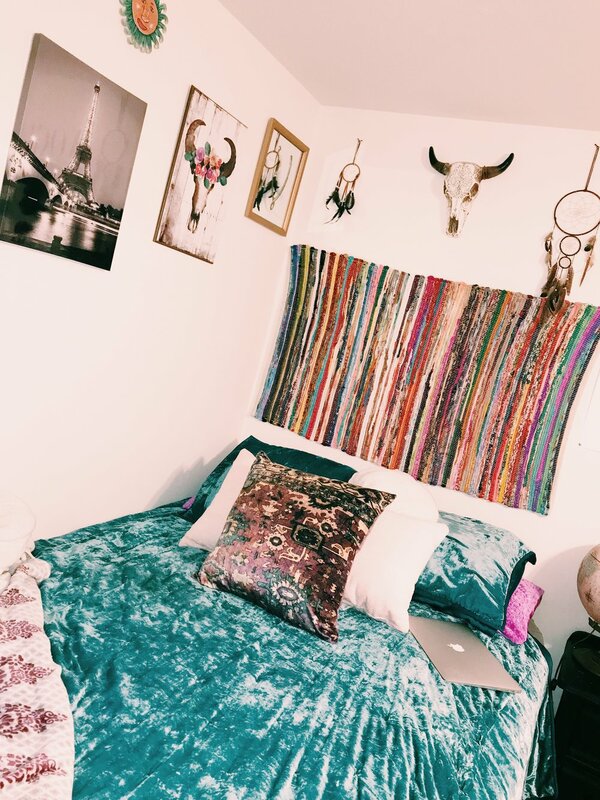 Maybe this will give you some inspiration of how to decorate a college bedroom on a tight budget! Let’s go ahead and get started! I’ll start with the most essential part of any bedroom: the bed!! I live in a full furnished student apartment so the bed that I have is the bed that came with my apartment. I wanted to create the idea of a headboard above my bed since the bed itself didn’t have one. I wen’t with this colorful rag rug that I hung up right above my bed. The rug came from Ross when I was shopping on a Chicago trip but I see very similar rugs ALL the time. I see them FREQUENTLY at the Dollar Tree. Above that I hung a few of my favorite pieces. In the center I have a fake bull skull that has an aztec design imprinted into the skull. Beside each side of it are my two dream catchers. The larger dream catcher came from Icing but the smaller one I got from a craft fair. It was handmade from a women in a Native American tribe. On the other wall next to my bed I have three other wall hangings. I have my Paris canvas which came from Hobby Lobby, the flowered bull skull wood painting that also came from Hobby Lobby and lastly the Wishbone mirror that I got on clearance from Michaels. My turquoise velvet comforter is from Target and I absolutely LOVE it. I accented it with two light pink pillows that also came from Target and an Aztec print pillow that I got from the clearance section of Home Goods for $8. Laying at the end of my bed is a multi-print fun blanket that I got for $14 at Ross. Next, I will talk about what is at the end of my bed. I keep a nice little hanging rack of all of my clothes that I recently got so that I can combine outfits together and it helps me keep organized about which outfits I want to take to photoshoots with me. On the back of the wall I have a canvas map that I received for Christmas that came from Hobby Lobby. My newest and favorite piece that I have in room is my baby pink locker. I got this at a craft fair and it was originally an ugly chipped red but my dad brought new life to it for me! This is where I keep all of the supplies that helps me shoot for my blog and for my Instagram posts. It helps me keep everything out of the way. Above it I decoated the top with a nice leafy plant that needs minimal watering nor light. 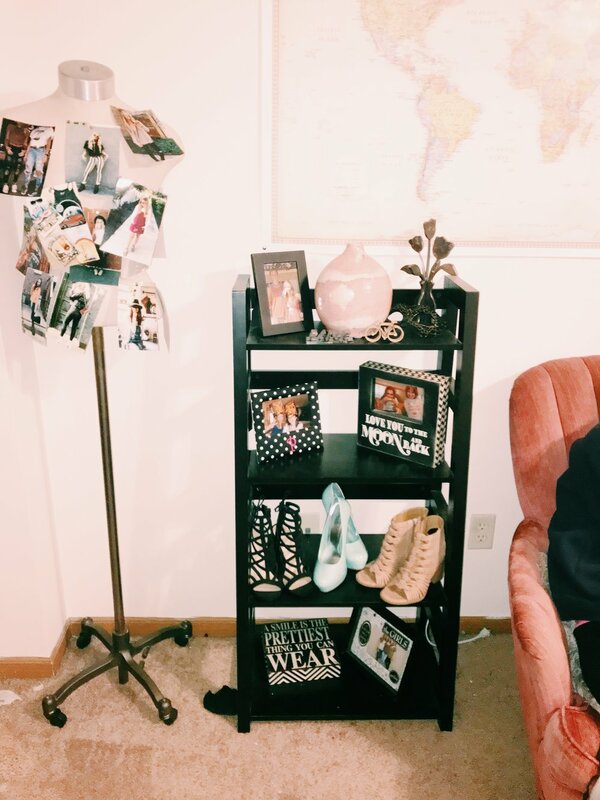 I also display ALOT of my favorite shoes around my room (you will see that as the tour goes on) and so I have a pair of my favorite boots displayed on the top next to a small painted globe from Target. The hanging plant holder came from TJMaxx and it has another leafy plant that doesn’t need a lot of natural light or water. 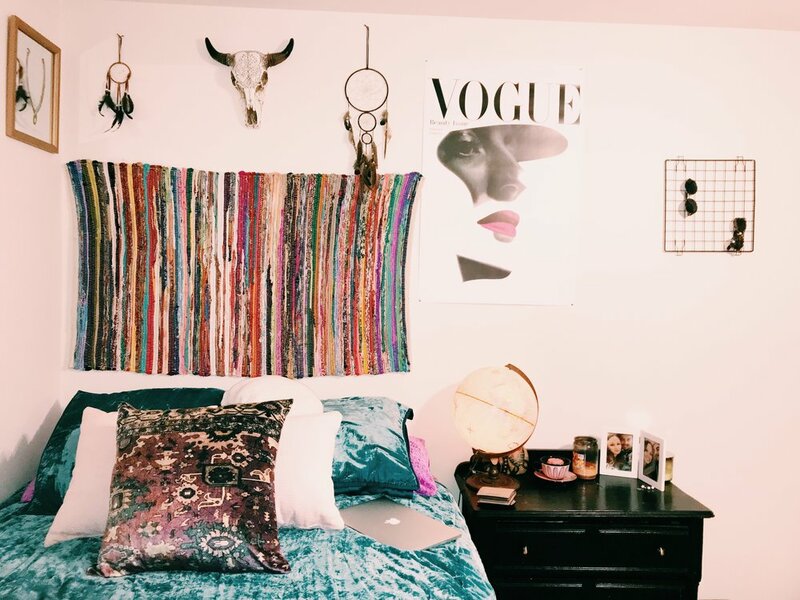 The printed curtains you see in the back came from Target and are the perfect “eclectic” style that I am going for in my bedroom. Next, we will move back to my bed area. Next to my bed I have a little baby dresser that I use as a night stand. On top I have another globe which is actually a lamp! My mom got it for me at a resale store! I absolutely love it! Beside it I have a cute little t-cup with a candle in it. This is a Friendship Candle that was given to me as a kid and I have kept it all these years in this little tea-cup! I also have photos of me and my boyfriend Dylan and me on my night stand. The dresser is actually an antique that I received over the years from my Great Grandma and knowing her I am sure it is from the late 1800’s as many of the great furniture pieces she has given me over the years are! It is absolutely perfect and I will never want to part with such a unique piece. Above my night stand you will see that I have a super unique VOGUE poster that I got on campus this past August at a poster sale! I also have a little wire inset that actually was an extra from a cube storage piece that I have underneath my bed. I hung it up on my wall so that I can hang sunglasses and pictures on it. This allows me to display all of my sunnies instead of them sitting in a drawer getting scratched up! I eventually want to get some small little clips and also hang some Polaroid photos of me and my friends among the sunnies on the wire framing! Next, you will see I have a little shelf that I use to keep knick-knacks and such on! On the first shelf, I have a picture of me and my good friend Riley on the top, along with a pink vase from Target and a vase of roses made of steel that my dad made for me at work! All of my friends love these and are always asking if he can make on for them! The other little wooden bike that you can barely see in the picture was also made by my dad! The second shelf is just some fun pictures of me and my family. The third shelf has more of my favorite shoes displayed on it! The turquoise shoes were the shoes I wore to my Freshman year of high school Homecoming dance! The last shelf is just a cute plaque and another photo with some friends. Beside the shelf is my absolute FAVORITE thing in my bedroom. This is a mannequin that I got from a store that was going out of business. On it I have taken push pins and displayed photos of my favorite fashion inspirations of the moment. I got this idea several years ago from watching Pretty Little Liars, because Hanna on the show had something similar to this in her room! I went ahead and attached an up close photo of the mannequin as well! Next I will be talking about my desk! I have my TV displayed here to take up less space! I have a metal decor piece that says my name on it. This is another piece that my dad has made me at his job over the years! I also have another flower piece in the corner that you can see! Beside it you will see a picture of the man himself (my dad) pictured with me when I was younger. 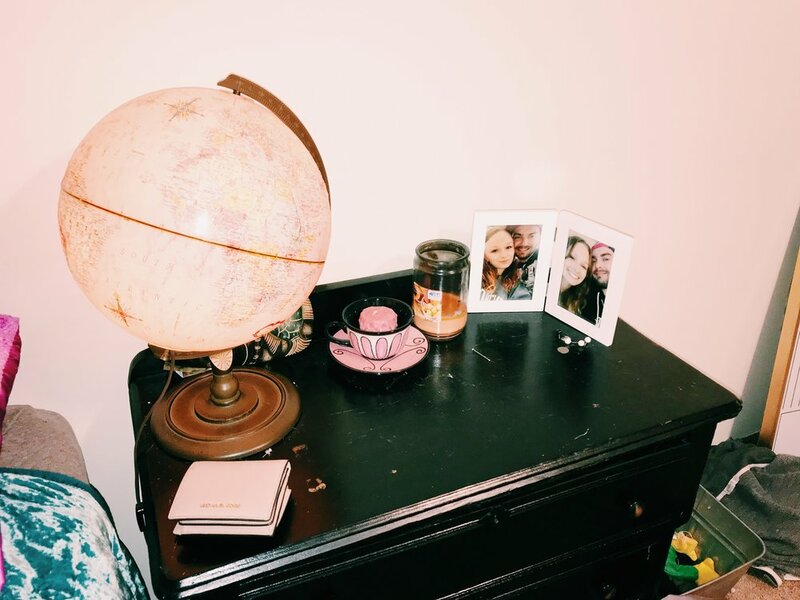 I’ve also got some other small knick knacks on my desk such as some Effiel Tower decor and a few pieces I picked up from different travels I have been on. This is just a nice place for me to study and to display some of the things I am passionate about. The desk came with the apartment and is a little beat up and worn, which tends to bug me sometimes but I plan on getting some stick wallpaper to put over the top so that you can’t see the scratches and peels because overall the desk is very sturdy and in great condition! Finally, the last part we will talk about in my actual room before we move onto my closet and bathroom! I have another small dresser placed right by the door of my bedroom. It feels a little awkward but it mostly for space reasons that I have it placed there. I have a LOT of clothes and I want to make sure I have place for all of them! Above it I have a black mirror that I got at Walmart and a old shutter, turned into a coat hook that I got from a craft show in my hometown! On top of the dresser is a picture of my dog Ollie from Christmas time.